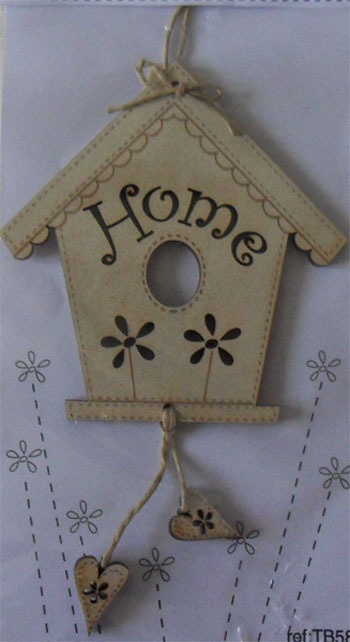 We recently received new sweet buttons and accessories in wood from the Bee Company: birdhouse, cotton reels, hearts, houses, birds, sheeps... If you don't know this collection yet, discover the dedicated page here. 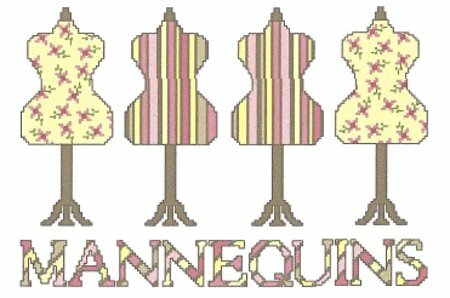 The Bee Comapny is a French brand of wooden embellishments for your stitched works be they cross-stitch, embroidery, patchwork or quilting. You can sew them on the work of your choice according to your inspiration or get tempted by one of the kits by Les Boutis de Lucie that use them. 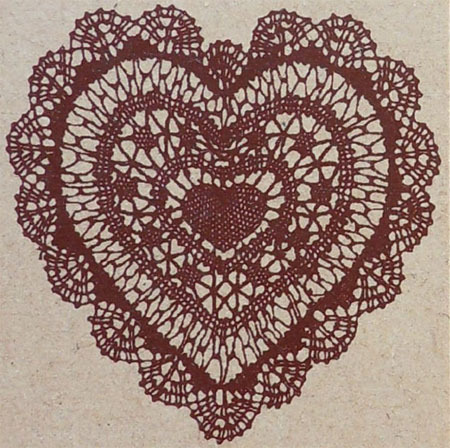 Do you like to stitch patterns related to your (favourite) hobby? Here is a treat for you: six matching patterns featuring cute sewing accessories and fabrics worked in a charming patchwork of colours. Choose between scissors, reels, sewing machines, buttons, tailor dummies and fabrics. You can work them without the text (which is for the moment only in French but should you like an English version, just ask and we will see how to help...). 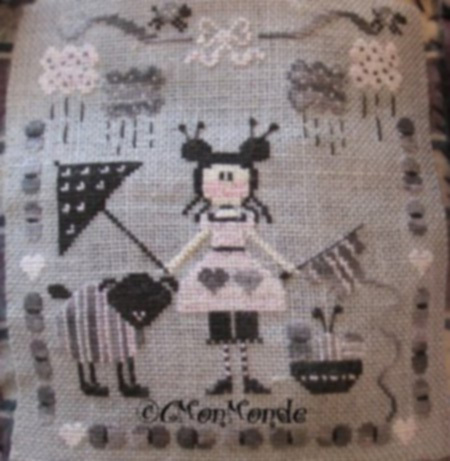 Alice and Co designs are always pleasant easily-stitched patterns and these series is no exception. So have fun with them! The latest design by Madame La Fée, Hanami, celebrates the Japanese traditional custom of enjoying the beauty of flowers. From the end of March to early May, Japanese people gather under the cherry blossoms to share an exceptional picnic. If you are fond of Asian or Japanese inspired designs, take a look at our "Other designs" collection where you will find Zen, another peaceful pattern by Madame La Fée. 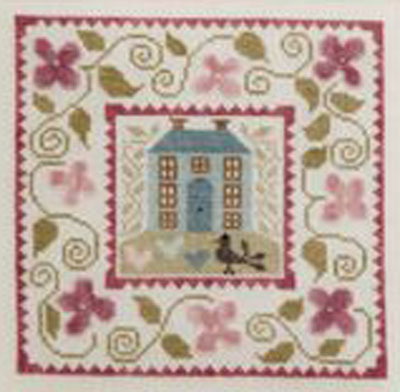 Based on Rose Anglais counted cross-stitch design by Zaza Picque, here is a sweet door hanger that will look great anywhere in your home or make a lovely gift. It is a complete kit: chart, fabric, pre-sorted threads (incl. some Gentle Art ones), needle, flowery fabric, vintage lace, mother-of-pearl buttons, rick-rack braid, padding, cardboard.The pretty mounting is easy to make thanks to the illustrated instructions in English. If you received our latest newsletter, don't forget to use your coupon code to benefit from the limited special offer. Not registered yet? Suscribe now (see right) to receive previews and special offers. It's raining, its pouring, well at least here in France and also in Il pleut Bergère design. Isn't she cute, this little shepherdess, standing under raining wool yarns with her knitting needles in her hair? When sunnier days come, let's head out In the Garden, Au Jardin for its fresh spring colours. There, we will enjoy a well-deserved tea break with Le Temps d'un Thé while admiring the subtle pink shades of the Tea Rose, Rose Thé. And after watching the cat playing with a mouse in Quand le Chat est là, it will be time to say Welcome at a Stitcher's Home Bienvenue chez une Brodeuse. Discover (or re-discover) two delicate and timeless designs by Le Lin d'Isabelle. 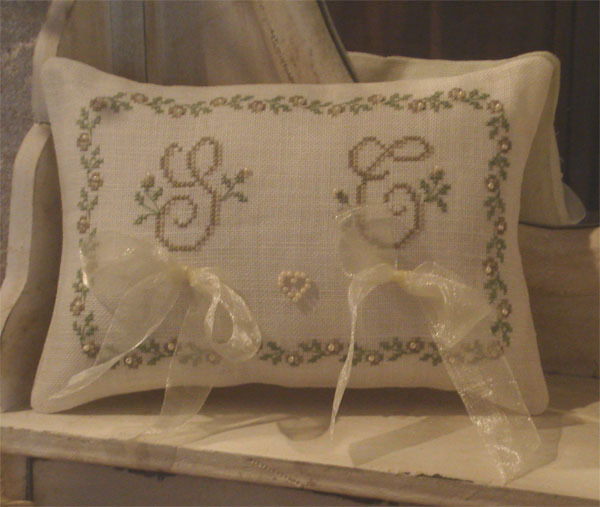 The "Little Flowers Ring Cushion" (see left) and "Coeur Fleuri Wedding Record" are now available as a kit (with linen fabric or Aida in linen). If you are looking for a different style for your special event, we suggest that you browse our "Hearts and Wedding" collection. 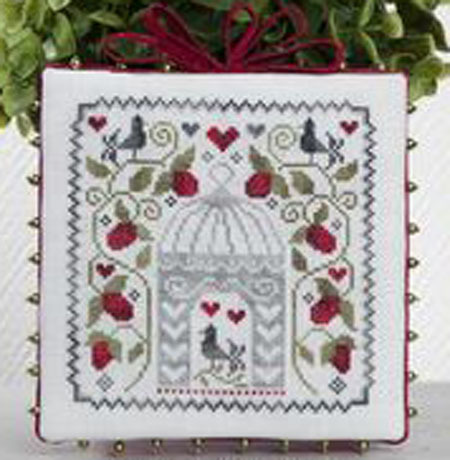 You will find there not only original French cross-stitch designs but also pretty embellishments, like for instance our heart-shaped genuine mother-of-pearl buttons. The latest Tralala designs have arrived! New gorgeous patterns by Tralala have been released lately. This colourful Maison Bleue (Blue House) is one of them. For sweet flowers, let's have a look also at Jardin des Roses (Garden of Roses). And I just like the delicate pattern of birdcage in C'est le Printemps (It is Spring Time). As you may know, Tralala loves designing sheeps and there is a new one dawdling Under the Apple Tree (Sous le Pommier). 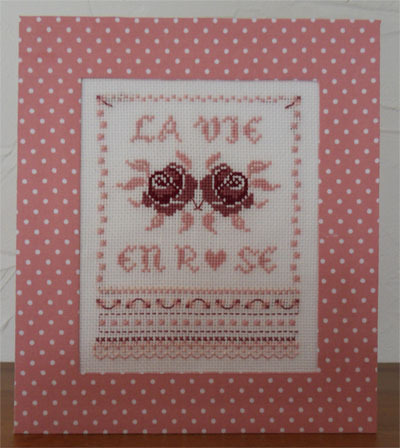 This new kit is based on La Vie en Rose pattern by Les Créations de Chrystelle. You will be able to use it either as a quite large card (for Mother's Day, Valentine's day, congratulations for a wedding... as you can write on the back) or else as a lovely frame to be placed on a shelf or a desk. This kit comes with the lovely pink dotted fabric, the strong paper sheets, some heart patterns for extra embellishments to be made with the fabric leftovers and full instructions in English with photographs. It is available either in 18 count linen Aida or in 32 count linen and cost £14. "Lady Fairy" really has the knack for designing some gorgeous evocative patterns and the latest one is no exception! In Vaisselle Ancienne (meaning Antique Crockery), Madame La Fée blends delicate shades of blue and red with flowery patterns which are really typical of the old china you find in France. This elegant design could be framed and placed either in the dining room or the kitchen. Brand new, with unique delicate designs, these wonderfully detailed artistic stamps can be used with great effect not only on paper but also on fabric! With them, you will create original and very pretty works on fabric, mixing them (or not) with embroidery stitches, using them to embellish a stitched work or to mark it (date, initials, etc.). You will also be able to personalize your stationery for small or great events like a wedding (just see the delicate series of hearts). There is currently an exceptional sale on some of Madame La Fée most popular kits. People who have followed us since the beginning know that we usually don't do sales and indeed, this is a first. So don't miss this rare opportunity to treat yourself or a friend at a never seen before price! All kits manufactured by Madame La Fée are top of the range items. These special prices will last only till Sunday 15 January included. Just click on the link "read more" below to browse the designs on sale. Read more: Exceptional SALE at SoCreaStitch! Released in France only today (14 Dec) and already at your favourite French online boutique! Madame La Fée latest design, "La Patisserie Rose" (the Pink Patisserie) is, in my opinion, a tribute to those wonderful patisseries you come across while walking around in Paris. This is a gift for you! Welcoming a new designer "Les Boutis de Lucie"
Back at work sorting the new designs that have just arrived! 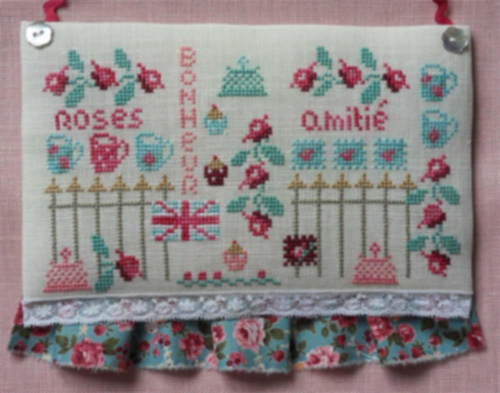 French stitching in the World of Cross Stitching mag! 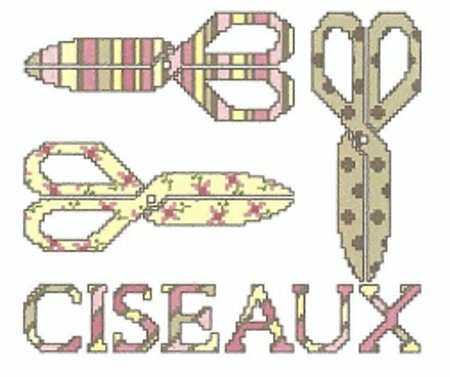 463 French cross stitch designs on board! Pinocchio, Alice, Denis, Leon and many more are waiting for you! Is it really too late to start a stitched Easter project? Cakes and sweets for all tastes! Exceptional: FREE delivery cost during 4 days! Two new cross-stitch designs by Tralala!